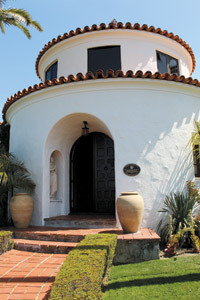 The home, built in 1927, is a true testament to the Spanish Colonial Revival style. 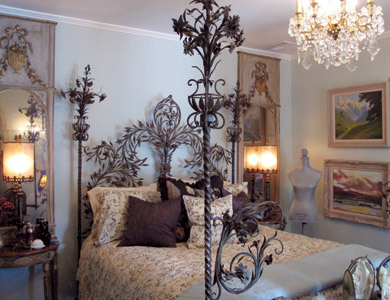 It has been meticulously furnished to period with hints of glamour from the Golden Age of Hollywood; glittering chandeliers hold court over spacious rooms, rich draperies line the windows and extraordinary works of art enlivens the walls. Outside, terraced walkways lead you through the estate, connecting the swimming pool, tennis courts and the many various gardens. Historical Landmark No. 866 is on the market for $12.5 million after its year-long renovation. 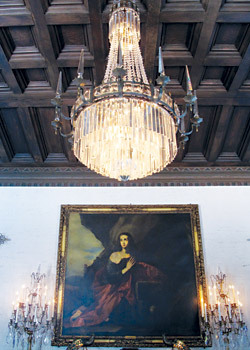 Interior designer Tommie Zimmerle worked to bring the estate back to its true historical style. 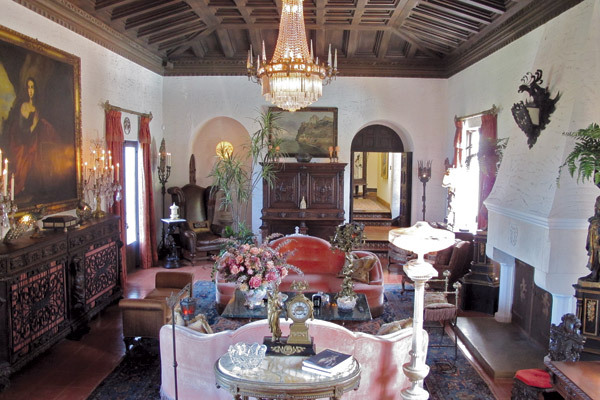 The solid bronze chandelier hanging in the entry was allegedly commissioned for Hearst Castle, but never made it to that estate. 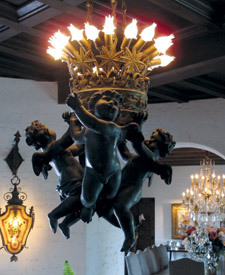 Instead, the fanciful putti hover from the heavily wood paneled foyer ceiling to welcome and delight guests with their playful charm. 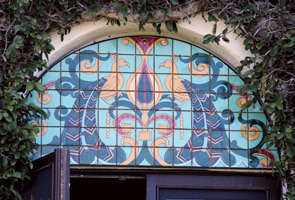 The piece was acquired in New York the same week that the home was purchased by the current owner. 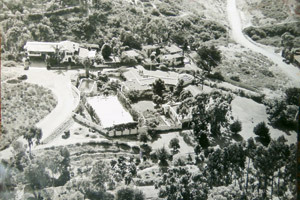 When it was built almost 90 years ago, this house was one of the only ones on the hill. But this estate’s historic significance is not the only thing that makes it remarkable; every inch of the house is graced with art. 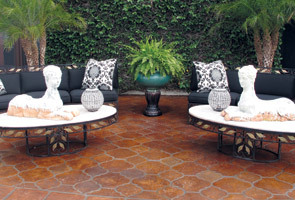 Zimmerle specializes in renovation and restoration, and has worked on several homes in La Jolla. 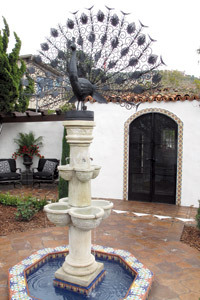 The McClintock house is a stunning example of the classic 1900’s Spanish Colonial Revival style, with white stucco walls, hand-carved wooden doors, ornamental iron work and graceful arches. The house also features courtyards and patios, tower-like chimneys, terracotta roof tiles, and, of course, carefully chosen décor — alabaster statues, stained glass installations and gilded candelabras. The stairs that lead up to the second floor turret are supported by a unique arcade ensemble. Most of the artwork that lines its walls is from the early 1900’s — in other words, the house’s contemporaries — or earlier. Works from well-known California artists like Sam Hyde Harris and pastoral painters like Alfred Conway Peyton flow effortlessly and compliment the 18th and 19th century Spanish & European pieces. 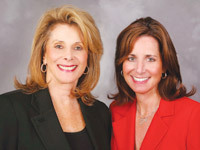 The Estate is currently listed at $12,500,000 with Maxine and Marti Gellens, Prudential California Realty 858.551.6630. This series of hand painted stained glass panels, miraculously still together and in excellent condition, dates from the early 1800’s. 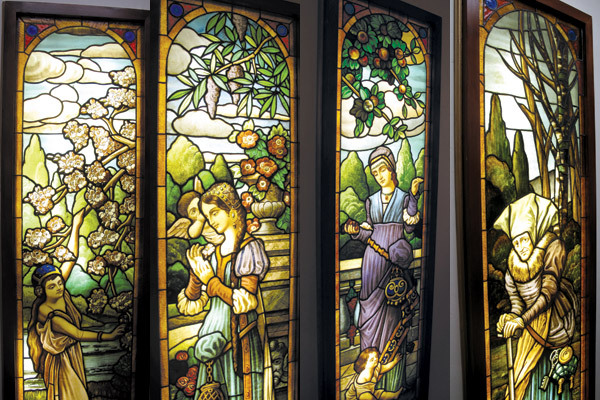 Each panel simultaneously represents one of the four seasons and one of the four stages of womanhood. Purchased from Tom Stansbury Antiques in Newport Beach. 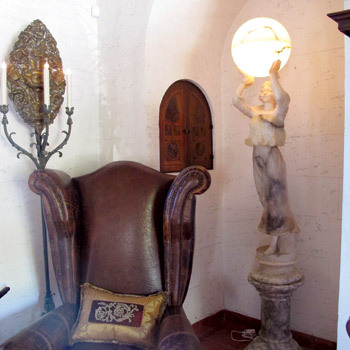 This imposing floor lamp is an alabaster sculpture of a woman holding a glowing orb. An American colonel purchased the piece in Europe during World War One and had it shipped to the U.S. in the 1920’s. “I’m a romantic; I feel like she is grabbing the moon for her lover,” Zimmerle said. The chandelier that draws the gaze in the living room pays homage to designer, current owner and original builder; all three are from Texas, and the chandelier was an acquisition from the famous King Ranch. 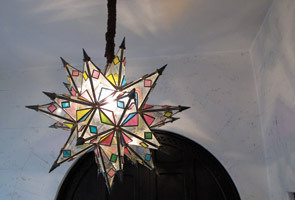 “It was meant to be in this house,” Zimmerle said. The painting, titled “La Magdalena Penitente,” a 19th century tribute to a 1641 painting by Jusepe (José) de Ribera. The original is a permanent installation in the Museo del Prado in Madrid, Spain. 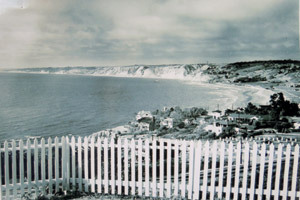 High in the hills of La Jolla, overlooking the cove and the cliffs, rests a unique Spanish-Revival style home — and a little piece of history. Historical Landmark No. 866 was built in 1927 for advertising mogul H.R. 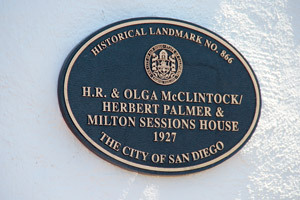 McClintock, who comissioned another historical building — the recognizable McClintock Storage Warehouse — in downtown San Diego. 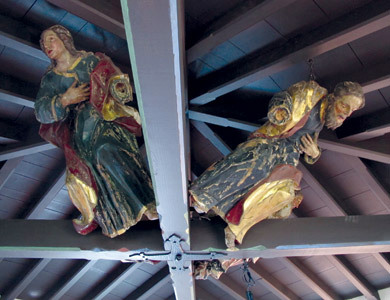 Both buildings were constructed in the Spanish Colonial Revival style, popular in the early 20th century, which was meant to pay homage to the original California missions. The architect, Herbert Palmer, was supposedly the son of King Edward VII of England. The home’s age shows itself in small, but distinctive ways, according to interior designer Tommie Zimmerle; for instance, the kitchen and dining layout was originally designed for a household with a staff. The house has gone through many owners in the last 90 years. 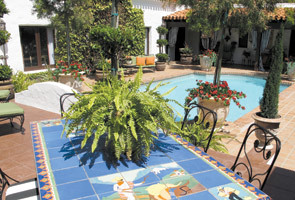 The swimming pool has changed location, several structures were covered in paint or concrete — and subsequently uncovered and renovated by Zimmerle — and added walls were removed to recreate the feeling of the house as it first was. “Extreme measures were taken to try and preserve the integrity and authenticity of the home,” Zimmerle said. On top of the layers of history, there is another bonus to owning a historical landmark — thanks to the Mills Act of 1995, designated historical sites can receive a 20-70 percent reduction in property taxes.